Comments: Do not buy this, in fact, do not ever buy anything from Bytecc. This thing has malfunctioned two my hard drives. Pros: The quality is outstanding and the power cable is way beyond what I expected! 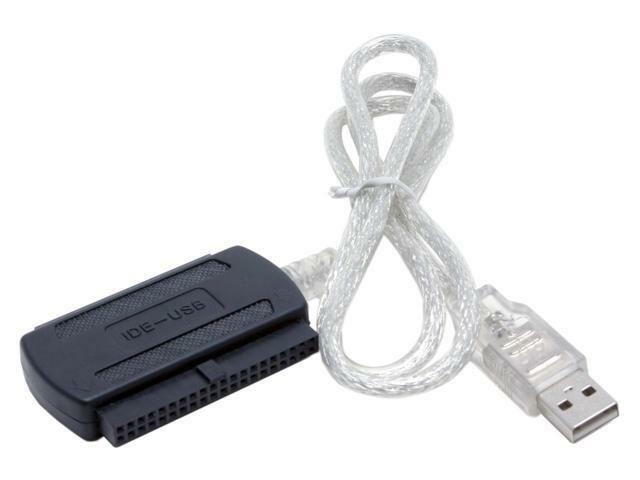 The USB-2-IDE connector appears top notch and well worth the cost of purchase+shipping. *Obviously this is meant to be used a a tool and not for using a 3.5" drive sitting on the desk rather than installing it inside the case. For temporary use to copy or something. Other Thoughts: Obviously you MUST be using a grounded 3 prong outlet. I would not recommed attempting to use a 3-to-2 adapter or an outlet that does not have a true ground. You must be careful of your hard drive electronics and static buildup while they are sitting on your table - don'lt let the cat walk around the table top. This is not designed to power CDROM devices. 2A max. Also make sure all of the cables are securely connected. One loose or tripped over power cord and you will most likely hear that POP sound and smell the smoke from the surge. Pros: I used it to add an internal IDE LightScribe drive I had laying around as an external, so I could copy/burn and Scribe all at the same time. No setup; detects as mass storage then automatically recognized as optical drive by XP. Pros: Works like a charm. I have used this with many hard drives/IDE devices and have had no issues. I like the fact that it has desktop and notebook drive interfaces. Solid construction. Cons: As others have mentioned, the power connector is ambiguous. The 4 pin power connection has soft rubber and the edges aren't well defined. If you aren't careful, you could plug it in upside down. Although this has never happened to me, it seems logically feasible that someone has done this. Pros: Very easy to use just plugged it into my old notebook's hard drive, plugged in the usb port and I was able to start transferring my old files in seconds. Other Thoughts: This product is simple enough for anyone to use, cheaper than taking your computers into a shop to get your files transferred and after you get your files you are able to use your old hard drive as backup/external storage. Pros: Able to get data off of IDE drive. Other Thoughts: Worked like a charm. Had no problems pulling data from an old drive. Pros: Adapter has worked great for transferring and storing data on external hard drives.